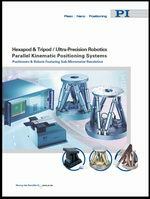 Hexapod precision parallel positioning systems are used for alignment and positioning in industries including optics, photonics, automotive, semiconductors and nano-scale automation. PI is the global leader in hexapod based precision motion control systems. With more than 1200 employees world wide, 40 years of experience in nanopositioning and motion control and 3 decades of hexapod mechanics, controller and software design experience, PI provides the broadest and deepest portfolio of precision motion techologies and can match your application to the appropriate technology better than anybody else. PI hexapods are available for different conditions and applications from ambient to vacuum and non magnetic. A new motion simulator, high-speed, linear motor hexapod is also available. PI recently acquired miCos, a motion control specialist with design experience in hexapods and other parallel kinematic positioning systems, to provide an even broader product offering. Our electro-mechanical and piezoelectric Hexapod Stewart-platforms have many advantages over hydraulic hexapods. They are smaller, provide much higher precision and most are self locking. Hexapods are available in many sizes, configurations for small loads from 2 kg to heavy loads of several tons. A recent investment in new building with test equipment and metrology for high load hexapod positioners has allowed us to further strengthen our leading position. All of PI's hexapods come with 6-axis motion controllers.